Fans mourning the loss of the great Alan Rickman can take comfort in the idea that, in the next world, the stalwart British thespian will be able to play all the roles he never get a chance to play in this one. 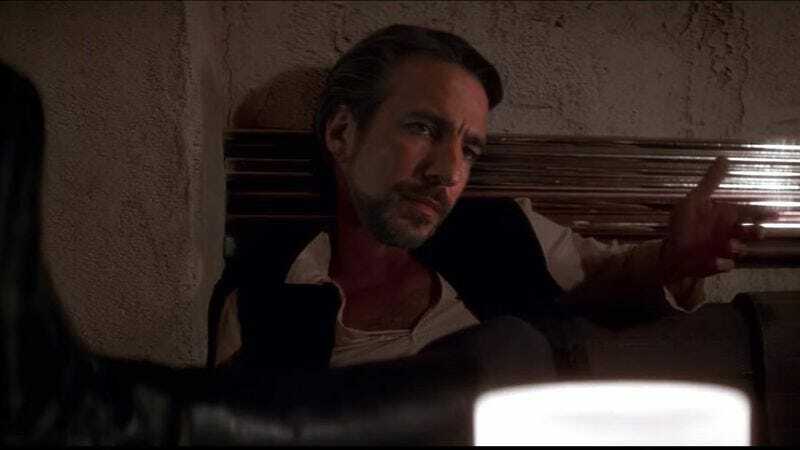 As an illustration, YouTuber Gerald Zecker has uploaded an ingenious little Star Wars/Die Hard mashup that substitutes Hans Gruber for Han Solo. At first glance, this seems to be built on a mere pun, banking on the similarity of the names, but there is a certain intoxicating bravado that unites these two characters. Neither Han nor Hans is willing to be played for a fool, and both have a knack for devastating repartee, even in high stakes situations. While the debate still rages as to who shot first in the infamous Solo/Greedo showdown, there is no doubt that Hans Gruber fires the first shot in his encounter with the warty, green-skinned debt collector, thanks to his utter lack of a bothersome moral compass.